Saverio “Sam” Salario packed his bag and boarded the cyberspace train on February 26, 2016, bound for Camelot and other utopian destinations along the way. Saverio, son of Stefano and Teresa (LaBarbiera) Salario, was born in Tampa, Florida, on June 11, 1920. He is survived by two brothers, Joe and Luigi Salario, of Tampa, Florida. Many will mourn him, including his nieces Janet Stout Toms and Lucy Scaglione Rodriguez, nephew Steve Salario, cousins Sonny and Gigi LaBarbera, friend Gregg DeChirico, and a host of other family members, neighbors and friends. Sam graduated Hillsborough High School, class of 1938. He served in the Coast Guard during WWII, making 28 crossings of the north Atlantic in troop transport convoys. After the war he continued his education at the University of Houston, where he began a career in real estate and acquired many properties, allowing him to retire by the age of 56. 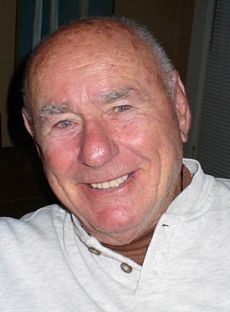 In 1976 he moved to Santa Barbara and became an active member of the community. His creative abilities flourished in his later years as he wrote many short stories and plays which capture the essence of his values and convey many of his observations on life’s lessons. A most magnanimous personality, Sam took an interest in everyone he met, mentoring and encouraging them to excel in all aspects of life. He will be missed.